I like to be thrifty, so I frequently buy scraps and yardage at rummage sales, yard sales, and goodwill. This can be a problem whenever I want to make something for L, or something to sell, and I want to know what kind of fabric I'm using. I recently found this experiment in 101 Sewing Secrets from the Singer Sewing Reference Library, and I knew I had to give this a try. Below is my paraphrased version of their experiment. 1. Birdseye Pique 100% cotton - this was my control fabric, since I knew for sure what it was. 2. a remnant bought at local craft store labeled "assorted flannel"
6. some kind of satiny feeling synthetic, I bought for a project in college before I paid attention to what it was made of. I have tons of this and like to use for linings and tags. Next: Hold a piece of each scrap (one at a time) in the fire for a moment, then drop in the glass bowl and watch. Note how it burns. 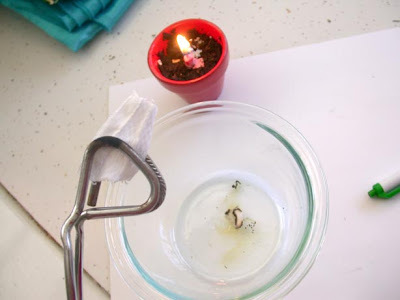 Does the fire go out as soon as you remove it from the flame or does it keep burning? Does it catch fire or just melt? Does it smell like burning leaves or paper, or chemically and plastic? When the fire is out and it has cooled to the touch, note what's left. Is it soft and ashy, a charred ash, or a hard melted bead? Wool and silk: will burn well, but more slowly. may go out after taking it out of the fire, smells like burning hair or feathers. will leave a crushable ash. Polyester, nylon, and other synthetics: will burn or melt only while in the flame or shortly after being removed. has a chemical smell and will leave a hard bead. 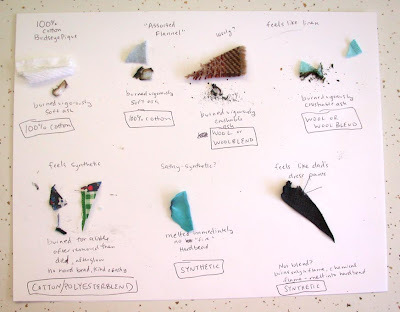 Acetate, and acrylic: burn and melt in the flame and after being removed, have a chemical smell, and leave a hard bead. Blends will burn like the dominant fabric, although you may see signs of both types. Obviously this won't give you very precise information about blends, or distinguish between two types of fabric in one group. But it's very helpful if you can't tell by sight and touch what it's made of. 1. I was glad I used a control fabric, because it gave me a good idea of what burning "vigorously" and "soft ash" meant. It would have been smart to do this with wool and polyester, too. 2. My flannel acted just like the birdseye, so it seems to be cotton or at least a predominantly cotton blend. 3. My "wooly" scrap seems to be wool! Or maybe a wool/cotton blend. 4. I was surprised that what I thought was linen seemed to have some wool in it. I feel pretty confident it is all/mostly natural fibers. It wasn't quite as crunchy as number 3, so I'm guessing some kind of wool/cotton/maybe linen blend. 5. This one sort of half melted, half burned, but stopped as soon as I took it out of the fire. It had a little ash. It smelled chemically, but didn't leave a hard bead. I'm guessing it's a blend of polyester and cotton. 6. This one melted in the flame, and stopped as soon as I pulled it out leaving a nice plastic-y bead. Clearly a synthetic, who knows which kind. 7. This one burned a little and melted. Also, clearly a synthetic, but I'm not sure what kind. Good idea. 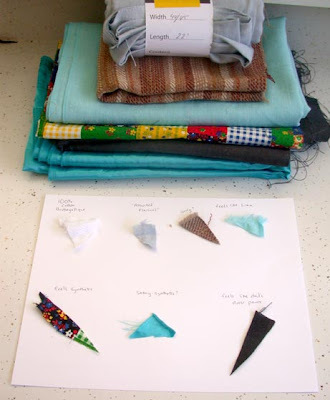 I'll have to try that on some of my mystery scraps--I'm a thrift store fabric buyer too. Thanks! This looks somewhat like a science fair project. Where did you get that cotton pique? I'm looking for some nice, but inexpensive! pique for a dress for Zoe. You should frame that chart. I think it would look really cool like that. Anyway, this was so helpful for because I just got a bunch of fabric from Goodwill and I haven't got a clue what it is. Thanks. i'm putting a link to your blog. it's homeschooling and crafting rolled into one! I love this idea and posted about it on The Crafty Crow last week :) I have a "Featured On" button for you if you would like, just email me. (I couldn't find an email address for you so I thought I would let you know here). Wonderful blog you have!